Announced less than a year after its predecessor, the new entry-level Nikon D60 DSLR camera is virtually identical to the D40x model that it replaces. The D60 has the same external design, 10.2 megapixel sensor, ISO range of 100 to 3200, 3 point auto-focus system, 3D Colour Matrix Metering II, 3fps continuous shooting speed and 2.5 inch LCD screen as the D40x. All of the important changes are therefore internal. Nikon have implemented the same EXPEED image processing engine that all of their DSLR cameras now use, promising better image quality. There's also a refined dust-reduction system, with the new Airflow Control System using air-pressure to help prevent dust from reaching the sensor. Active D-Lighting can now be turned on before taking a shot, and the new Eye Sensor turns off the LCD screen when you look through the viewfinder. The ability to process RAW files in-camera, orientation of the LCD display to either portrait or landscape, and a rather curious stop-motion movie mode complete the list of improvements. With an ever-increasing list of entry-level DSLRs now available, Mark Goldstein finds out if the new Nikon D60 is worth considering. When you first take the Nikon D60 out of its box, you can literally feel why this digital SLR is so cheap. Its all-plastic construction makes it very light, especially if you have used a more expensive DSLR before. The same is true of the supplied 18-55mm f/3.5-5.6 VR kit lens, which again is made entirely of plastic, although it is a little more substantial than the standard 18-55mm, non-VR lens. At this point you may be wondering if you made the right purchasing decision, but fit the body and lens together and it all begins to make much more sense. Suddenly you have a well-balanced package that is light by DSLR standards at less than 500g, but which doesn't feel flimsy or inconsequential. Nikon have also resisted the urge to make the D60 as small as some of its main rivals, with a chunky handgrip and a "business-like" design that is functional rather than pretty. The D60 is definitely designed for "normal" hands, and this helps to negate that initial feeling of the camera being too light and plasticky. Despite being aimed at the new digital SLR owner, the D60 is still a fairly complex camera in terms of functionality and the number of external controls that it offers, with around 16 in total and some of them having more than one function. Despite the presence of so many buttons and switches, the Nikon D60 doesn't feel too cluttered or intimidating and quickly becomes second-nature to use. The D60 is very comfortable in terms of handling. The camera has a deep, contoured handgrip on the right-hand side, coated in a rubberized compound to aid grip, that enabled me to use three fingers to hold it and my right forefinger to operate the shutter button. There is a small contoured area where your right thumb sits, with the rest of the body finished in shiny smooth black plastic. The 18-55mm f/3.5-5.6 VR kit lens that Nikon supplied feels well-balanced on the Nikon D60 and it fits into place with a reassuring mechanical click. It also adds the very important advantage of Vibration Reduction. Nikon bodies don't offer any form of in-camera image stabilisation, unlike similar models from Sony, Pentax and Olympus, so the affordable 18-55mm VR lens is well worth the slight additional cost, rather than the standard 18-55mm lens. 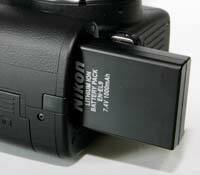 The shutter release action on the Nikon D60 is quite loud and mechanical, something that you will either love or hate. I liked it, although it isn't great for close-up candid photography as your subject will probably hear you if you get too close. The Nikon D60 is generally well-made and designed. The Nikon D60 follows conventional DSLR design in having a shooting mode dial on the top of the camera, which allows you to select either one of the advanced modes like Aperture-priority, or 7 scene modes. The Exposure Compensation button is thoughtfully positioned next to the shutter button. Hold down the Exposure Compensation button with your right forefinger and spin the dial on the top-rear of the camera with your thumb to adjust its settings - simple and intuitive. One of the few external changes from the D40x is the new Active D-Lighting button, which replaces the Info button next to the shutter release. Active D-Lighting is a software processing routine that attempts to preserve details in both the shadow and highlight areas of high-contrast subjects, and it can now be applied both before taking a shot, or afterwards (I couldn't see any difference in the results of using either mode). The Info button has now been moved to the rear of the camera, but it's still at the heart of the D60's ease-of-use. 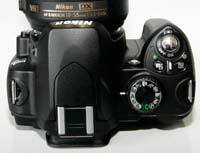 Nikon removed the top LCD panel in order to make the D60 smaller than its previous DSLRs. Consequently, they had to find a way to display the very useful information that was previously shown on this screen. Enter the Info button - pressing it displays virtually all of the camera's main settings on the large rear LCD screen. Existing DSLR owners may think that the removal of the top LCD panel is a backwards step, but I think the D60's target audience will love it. Compact digital camera owners use the rear LCD screen all of the time, so it make perfect sense to utilise it on the D60. Even more impressively, Nikon haven't stopped there. If you press the Info button and then the Question Mark button (they're now actually the same button on the D60) on the rear of the camera, you can actually move around and change 12 of the most important settings, including ISO speed, white balance, file quality and flash mode. There's even a graphical representation of each setting which clearly shows the results of the changes that you make. You could never do any of that on a top-panel LCD! Also new on the Nikon D60 is the Eye-Control feature. This doesn't automatically start the auto-focus system when looking through the viewfinder, as with Sony's DSLRs. Instead it turns off the LCD screen to help conserve battery power, and to stop the bright display from distracting you. Despite this addition, I didn't notice any major improvement over the D40x in terms of battery life, with the D60 managing around 450 shots (most without flash) before the battery was depleted. The LCD screen display now automatically rotates to match the orientation of the camera - hold it in portrait mode and the information shown on the screen rotates through 90 degrees, a useful feature that makes the camera even easier to use. Nikon have simplified the way that the Shutter-speed, Aperture and Manual modes are implemented on the D60. Instead of having two dials as on the D80, one just below the shutter button on the top of the handgrip which changes the shutter speed, and the Main Command dial on the rear of the camera which changes the aperture, the Nikon D60 only has the Main Command Dial on the rear. This means that it is more difficult to alter the aperture and shutter speeds when the camera is set to Manual mode, as you have to hold down the Exposure Compensation button and turn the dial at the same time to change the aperture. Most D60 users may never notice this, as they may never use the Manual mode, but more experienced photographers should take note. Other notable omissions that have been inherited from the D40x include the lack of a Depth of Field Preview, any bracketing functions, and dedicated buttons for ISO speed and some other commonly used options (although you can customise the inconveniently located Function button to access one of these). Considering that this is a complicated digital SLR camera with an array of advanced features, the Nikon D60 has a clean and uncluttered design that will be familiar to anyone who has used a DSLR before, although it will be initially intimidating for someone who hasn't used one. Users of bridge-style compacts will be most at home. I strongly recommend that all users read through the excellent user guide first, which contrary to recent trends is actually printed rather than supplied on a CD. The menu system of the D60 is very clear and easy to use. There are 5 main menu options, Playback, Shooting, Custom Setting Menu, Setup and Retouch, represented by both icons and text. The various options in each of the menus are clearly displayed in a large font size, and cleverly the current setting for each one is shown to the right as an icon - very neat. The most complex menu is the CSM one, with 19 different options available, although many of them will only need to be set once (and you can also change the menu to "Simple" mode so that only 6 options are shown). Overall I found the menu system easy to read, understand and use - full marks to Nikon. One prominent feature in the Nikon D60 menu is the expanded Retouch menu section which allows you to perform in-camera image editing, effects and enhancements. These include automatic red-eye correction and cropping facility, as well as a D-lighting image optimising function and monochrome and filter effect settings. New additions include Quick Retouch, NEF (RAW) Processing, Stop-Motion movies and Cross Star and Color Intensifier filters. The in-camera RAW processing sounds intriguing on paper, but in practice it's rather limited, as you can only change 5 parameters (quality, size, white balance, exposure compensation and optimisation). Stop-Motion creates a stop-motion animation from a sequence of images, at either 15, 10, 6 or 3fps. While many users might prefer to have more control by editing images via a PC, most of the filters are quite useful nonetheless, delivering reasonable results in a few seconds. The start-up time of the Nikon D60, from turning the camera on to being ready to take a photo, is very quick at around 1/2 second. The Nikon D60 "only" has a 3-area autofocus system, but I found that focusing is quick and consistent in good light with the standard kit lens, and the camera happily achieves focus indoors and in low-light situations thanks to the powerful AF Assist light. This system does struggle with more action-orientated photography, however, so sports photographers will want to look elsewhere. The 18-55mm VR kit lens is quiet in operation and feels well balanced on the D60 body. The large, high-resolution 2.5 inch LCD screen is bright, clear and has a perfectly acceptable refresh rate. 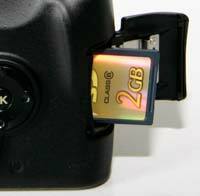 It takes about 1 second to store a JPEG image at the highest quality setting with no discernible lockup between taking shots, allowing you to keep shooting as they are being recorded onto the memory card. 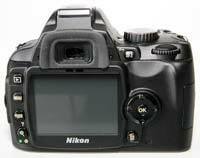 For RAW images the Nikon D60 takes about 3 seconds to store an image and there is also no lockup between shots until the buffer is full after 9 shots - at this point the shooting rate slows down until the buffer is cleared. In the best quality JPEG mode, the D60's continuous mode allows you to take 3 frames per second for up to 100 shots. Once you have captured a photo, the Nikon D60 has an excellent range of options for playing, reviewing and managing your images. You can instantly scroll through the images that you have taken, view thumbnails (in 2 different sizes), zoom in and out, and view detailed information about each image by pressing up or down on the Multi-selector. You can also delete an image, automatically rotate an image, view a slideshow, set the playback folder, and set various printing options. And there are also all the Retouch menu options previously mentioned. Importantly the Nikon D60 displays a wealth of information for each photo, accessed by pressing Up on the navigation pad. This includes a luminance-based histogram, which is a great help in evaluating the exposure, plus any areas that are over-exposed flash on and off in the LCD preview to show you what you should be compensating for with your next attempt. In summary the Nikon D60 is an all-plastic yet well constructed DSLR that is intuitive to use. Nikon have taken the �If it ain�t broke, don�t fix it� approach, refining the design of the D40x rather than introducing any really significant innovations. PhotographyBLOG is a member of the DIWA organisation. Our test results for the Nikon D60 have been submitted to DIWA for comparison with test results for different samples of the same camera model supplied by other DIWA member sites.